In 2016 I discovered Iplehouse ball jointed dolls and fell in love with them. I currently own two of them. My first one I acquired is named Sierra, from the JID collection. She's about 17 inches tall. When I ordered her, I also ordered the wig and outfit she was shown wearing on the Iplehouse web site. One of the cool things about these dolls is you can customize them. There are usually 2 or 3 choices of face painting, or you can get them unpainted, and you can choose the skin color too. They arrive naked, bald, and sometimes with eyes or without eyes. Sierra came with light brown eyes. I replaced them with deep violet eyes. 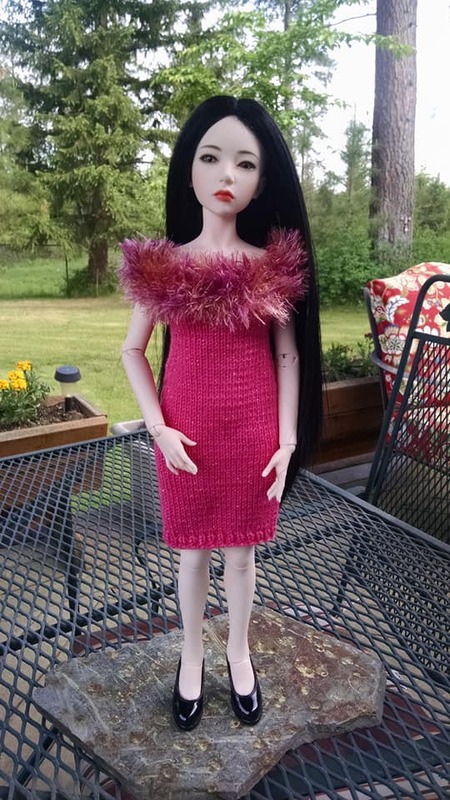 Asa is my second Iplehouse JID doll. I wanted the little red dress, but they were out of stock. So she came naked. 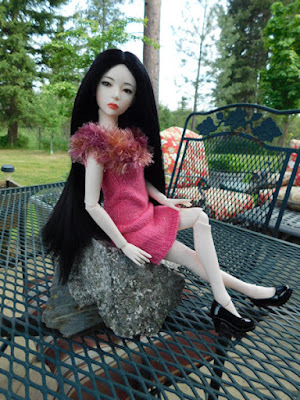 I have been making clothes for her, including the pink dress above with the fur collar. Some day I hope to find that little red dress.